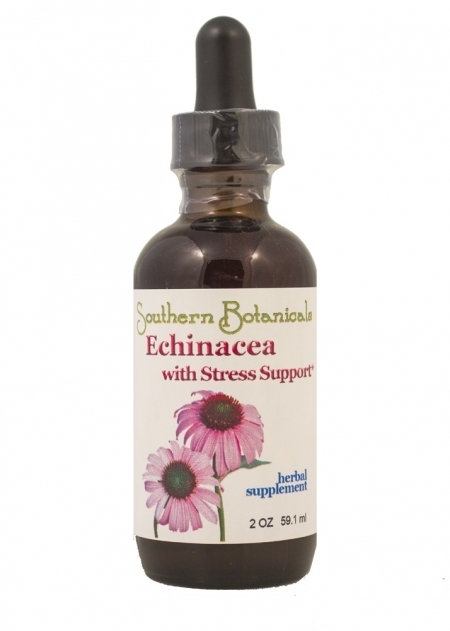 Echinacea with Stress Support is a liquid herbal supplement that contains the adaptogen Eleuthero root which helps support your adrenal glands when you're feeling stressed. An adaptogen herb like Eleuthero helps your body adapt to changes in the environment. Eleuthero also supports mental focus and can help you concentrate comfortably despite physical and mental stress. Along with Eleuthero, this formula contains not one but three powerful extracts of Echinacea roots and seed! Most people these days have heard of Echinacea and its immune supporting qualities. This herb is so well-known that a flood of greedy manufacturers have sought to cash-in on the trend, putting out weak Echinacea products that frankly do not work. Real Echinacea is so active that if you put it on your tongue for a few moments, your tongue gets numb and tingly. Try that with most commercial Echinacea products - nothing happens! Now try Echinacea with Stress Support and feel the Echinacea tingle! The organic Echinaceas used to make this supplement are extracted through a process of "triple tincturing" that wrings every last drop of potency from each herb. This creates an intense herbal concentrate unlike anything you've ever tried before. Ingredients (*Organic, +Wildcrafted): Echinacea Angustifolia Root*, Echinacea Purpurea Root* & Seed*, Eleuthero Root*, Pau d'Arco Root* and Garlic in a base of distilled water and certified organic GMO-free alcohol. Take 1 to 2 droppersful 3 - 4 times daily. May be taken under the tongue or in 2 oz. of water, juice or tea. You may take 1 to 2 droppersful every hour for a day or two.